20-40 milimetres of rain is expected. Well, that’s just brilliant. IF YOU’RE JUST about to head out the door and think it looks like a pleasant morning, don’t be fooled. Met Eireann has issued a yellow status weather warning that comes into effect from 9am this morning. Heavy rainfall is expected today, with 20-40 millimetres likely. Great. The warning is going to last all day, so bring that brolly, raincoat, or wellies – whatever you think will see you through the day. Rain is expected to become persistent and occasionally heavy in Munster and Leinster but Connacht and Ulster might have it a bit easier, with only showery outbreaks. 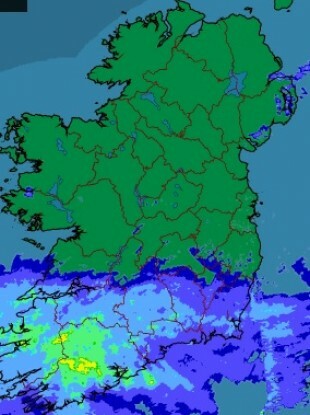 Good news if you are heading out tonight, as Met Eireann reports the rain will die out in most areas. We’ll still have to wait for the summer temperatures to kick in as it’s going to be rather cool, with highest temperatures 8 to 11 degrees Celsius. Come on Mother Nature, give us some sunshine and heat. Don’t we deserve it? Email “It may look pleasant, but don't be fooled. There's a lot of rain coming ”. Feedback on “It may look pleasant, but don't be fooled. There's a lot of rain coming ”.